It is not necessary for all pregnancies to receive an echocardiogram. The prenatal ultrasound tests that are done prior to birth can give information about whether the fetal heart has developed all four chambers. Most unborn babies do not require any further testing. Fetal echocardiograms are usually performed in the second trimester of pregnancy, at about 18 to 24 weeks. A fetal echocardiogram is performed by a pediatric cardiologist who is specially trained. The test is typically performed by placing a probe over the mother's abdomen to visualize the fetal heart. Doppler echocardiography. This Doppler technique is used to measure and assess the flow of blood through the heart's chambers and valves. Also, Doppler can detect abnormal blood flow within the heart, which can indicate such problems as an opening between chambers of the heart, a problem with one or more of the heart's four valves, or a problem with the heart's walls. Color Doppler. Color Doppler is an enhanced form of Doppler echocardiography. With color Doppler, different colors are used to designate the direction of blood flow. This simplifies the interpretation of the Doppler images. Amniocentesis. A test performed to identify the presence of chromosomal and genetic disorders and certain birth defects. The test involves inserting a needle through the abdominal and uterine wall into the amniotic sac to retrieve a sample of amniotic fluid. 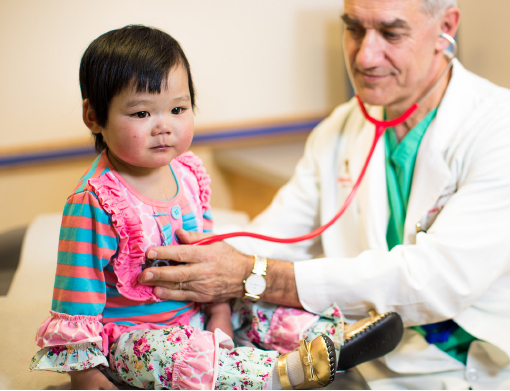 Children's National offers pediatric services at this Fredericksburg location.